Bringing over thirty years’ experience with international business communications, fifteen years’ exposure to IP-based communications and five years covering IP-based communications (with a focus on Skype) and smartphones, Voice On The Web’s Reference Guide has the goal of sharing this wealth of accumulated information with the Skype and smartphone user community. While largely focusing on Skype, since it has become the world’s most widely used real time social networking and communications service, the Guide also provides information on other IP-based communications services, some of which incorporate Skype’s services. Our content focus is on the user experience; if you’re looking for technical information, there are lots of other experts from that perspective out there. Install the software, set up an account, enter some contacts into a directory and make a call. Skype has kept it simple. Making calls has to be pretty straight forward – find a contact name and click-to-call or click-to-chat. Once into a conversation all parties can get into the “rich” aspect of Skype calls. There are many features of Skype that can enhance and support the conversation – file transfer, desktop sharing, conversation archiving with search, recognize URL’s when they are entered into chat and more. But it’s not simply about making the call. The user experience also involves, not a desktop phone, but rather a wide range of hardware that delivers the audio, video and Internet connection. In fact, some of this hardware has been developed to support Skype’s unique audio, video and networking technology embedded in the software. Few realize that you can edit (or even remove) a chat message; others are not aware how to access a chat window when that big, black “blind” comes down in the conversation pane when a call is answered. Having the right hardware can enhance the voice quality and video stream. The Voice On The Web Reference Guide talks about these and may more features and issues. Over in the sidebar you’ll find an accordion menu from which you can select a topic to view. Not only is there discussion of the Skype software – the core element of Skype, hardware, but also about PSTN-connected services, collaboration tools, calling plans and managing Skype in a business. We will, to the best of our ability, will try to keep it up to date, not only with new services but also modifications of ongoing features and services. Browse through the directory, make comments and provide (constructive) feedback. Hopefully you’ll learn something that can will enhance your Skype experience. Register via the email “Subscribe” form at the top of the sidebar to receive regular updates and newsletters about the evolving world of Skype and IP-based communications. Rest assured – we respect your privacy and will ask you about the types of emails you wish to receive. Complementing this guide will be the forthcoming release of an electronic document, “Experiencing Skype in Personal and Business Communications”, with additional background and information to assist the business entrepreneur and manager with understanding how Skype evolved, how it works and how it can be implemented in business – especially when it comes to the collaboration tools, communications processes and hardware you and your colleagues use to make and receive calls. While this document has a focus on using Skype in the small to medium business or as a professional practitioner, its content can assist with personal communications as well. And it deals with issues of managing your communications costs while using Skype and other IP-based communications services. (It’s becoming a very grey dividing line between personal and business communications in an “always-on” world.) We’ll update this page when it’s available for purchase. Interested in implementing Skype in your business operations? While attempts have been made to verify information contained in this publication, in view of human errors or changes in technology in the future, neither the author nor the publisher assumes any responsibility for errors, omissions, interpretations or usage of the subject matter herein. This publication contains the opinions and ideas of its author and is intended for informational purposes only. The author and publisher shall in no event be held liable for any loss or other damages incurred from the usage of this publication. Every effort will be made to correct any incorrect or inaccurate information – and corrections can be emailed to editor@voiceontheweb.biz. Limit of Liability and disclaimer of warranty: The author and publisher of this guide and the accompanying materials have used their best efforts in preparing this document. The authors and publisher make no representation or warranties with respect to the accuracy, applicability, fitness, or completeness of the contents of this document. They disclaim any warranties (expressed or implied), merchantability, or fitness for any particular purpose. The authors and publisher shall in no event be held liable for any loss or other damages, including but not limited to special,incidental, consequential, or other damages. As always, the advice of a competent legal, tax, accounting or other professional should be sought. This Guide contains material protected under a Creative Commons License. Any unauthorized use of this material is prohibited. 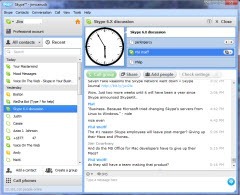 “Skype” and related names are the property of Skype, LLC. No relationship with or endorsement of this publication by Skype, LLC should be inferred.